August is National Picnic Month, and there’s no better way for family members young and old to get together to enjoy each other and the great outdoors. Picnics can be held anywhere, and they are especially enjoyable for elderly adults that spend a lot of their time indoors. Family caregivers that look after elderly relatives should think about putting on a picnic soon. * They bring up memories of fun family events, summer celebrations and special activities. * Seniors can enjoy the beautiful setting and a change of scenery. * It can inspire social activity because elderly adults can talk to other people. * Exposure to the sun can trigger an elderly person’s body to produce vitamin D.
* Fresh air is a healthy alternative to stuffy indoor air or air conditioning. * The new activity can eliminate isolation and boredom, common in homebound seniors. * Increased exercise and activity is good for an aging adult’s health. * The new setting may trigger an increased appetite for picky seniors. Picnics provide so many benefits for aging adults, and the good news is that they are not hard to do. It doesn’t even have to be a family affair, although it’s a great excuse to get together. Family caregivers and elderly care providers can throw together a few items for lunch and head to the local park. They can even try a different park per week and find out new places to enjoy as part of the adventure. 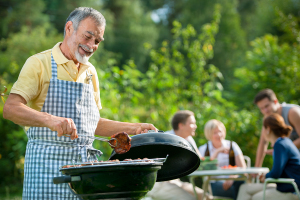 While picnics are always a good idea, there are certain factors that caregivers and elderly care providers need to consider, ensuring the aging adult is always safe and healthy while outside. Of course, seniors should always wear a protective sunscreen that prevents the aging adult from sunburn and harmful UV rays. If possible, the elderly person should be seated in a comfortable chair in the shade. Hydration is another important part of a successful picnic with seniors. It’s easy to get dehydrated, so seniors should always have plenty of water to drink. Other senior safety tips that family caregivers and elderly care providers should follow include food storage and food transportation. If food is not properly taken care of, it could develop bacteria and endanger the health of the aging relative. Food poisoning is especially hard on aging adults, so picnic food should always follow the basic guidelines for preparation and storage. There’s no excuse to put off a family picnic during National Picnic Month and inviting along an elderly relative. Family caregivers can arrange a big gathering or an elderly care provider can put together a more casual and low key visit every week. Either way, picnics are good for a senior’s body and mind as long as all the safety precautions are taken. This entry was posted in Elderly Care Cordova TN, Fun Activities/Crafts and tagged Elderly Care Cordova TN. Bookmark the permalink.